March 10, 2016 — Operation USA has a unique history in Ethiopia. During the east African famine of 1984-85 we flew the very first 747 cargo jet ever to land at Addis Ababa’s airport, thereby doubling its capacity to receive emergency aid. Our 120-ton shipment of emergency supplies was matched by a second flight we arranged for USA For Africa, the music industry’s response to the crisis, in mid-1985. USA For Africa also tasked OpUSA with vetting over $17 million in grants it made to a number of international agencies working in eight east African and sub-Saharan countries to combat the drought. Its “We Are The World” effort eventually raised over $50 million to help in this effort. Today, times have changed with an increasing number of crises demanding the public’s attention. Most relief groups and area governments worry that famine relief and support for Africa this time around will be lacking. 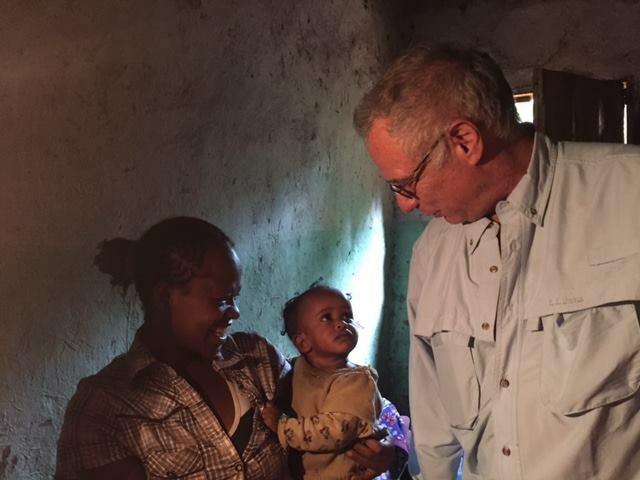 Recently, OpUSA President and CEO Richard Walden traveled to Ethiopia and visited the International Development Association (formerly Play Therapy Ethiopia)–a nationwide program we have supported there for many years–which provides psychosocial support to vulnerable children. On this trip, he spoke with program organizers, visited with children and assessed what we, as an international aid NGO, can do to assist the victims of the worsening famine in many parts of the country. While “El Nino” causes weather chaos around the globe–hopefully ending California’s 4-year drought–it is exacerbating conditions in Ethiopia, causing its 4-year drought to worsen with no end in sight. Nearly 10 million people are currently in a state of extreme “food insecurity” with 1 million on the brink of starvation. A drought is the visual opposite of an extreme weather emergency like a cyclone, typhoon, hurricane or severe flooding, all of which cause sudden and extensive damages. Drought and famine do not earn headlines and grab attention until the images slowly emerge of dried out agricultural fields, lowered water levels of lakes and other water sources, and, inevitably, horrifying images of starving children and young mothers unable to nurse their newborns. By the time those images emerge, conditions will already be extreme and affected communities will be waiting for critical aid to arrive. We need to act now to offset the consequences of El Nino and ensure that those who are already suffering due to drought and famine receive the aid they need now and will continue to need as conditions get worse. Operation USA will focus relief and recovery efforts on supporting local nonprofit groups which have come of age since the mid-1980s, when we first worked in the country. Ethiopia is awash with talented local people committed to helping. While they lack the financial and other material resources to cope with a vast famine, they can shoulder the burden if supported intelligently by friends around the world. Access to safe drinking water and agricultural inputs like seeds, fertilizers, irrigation materials and hand tools is urgently needed. Coping with hunger requires simple foods and food supplements along with prompt medical intervention to save fragile young lives. With over 36 years of experience empowering local organizations and delivering relief materials, medical supplies and hospital equipment to areas in need around the world, Operation USA is well equipped to be helpful and effective in combating the effects of drought and famine across eastern Africa. We hope you will join us in our efforts to support Ethiopia and its neighbors during this critical time. To learn more about drought and famine in Ethiopia, click here. To stay up to date on all the latest news from Operation USA, join us on Facebook and follow us on Twitter. To sign up for an easy, automatic monthly recurring donation in support of Africa, click here. Donations of United Airlines miles are also welcome and appreciated. Just click here (and scroll down to Operation USA) to donate miles now and help Operation USA staff travel to areas in neeed.